Illustrates the area southwest of Mexico City which is now the upscale neighborhood of Jardines del Pedregal. Battles of Mexico, Line of Operations of the U.S. Army under the command of Major General Winfield Scott, on the 19th and 20th of August 1847. 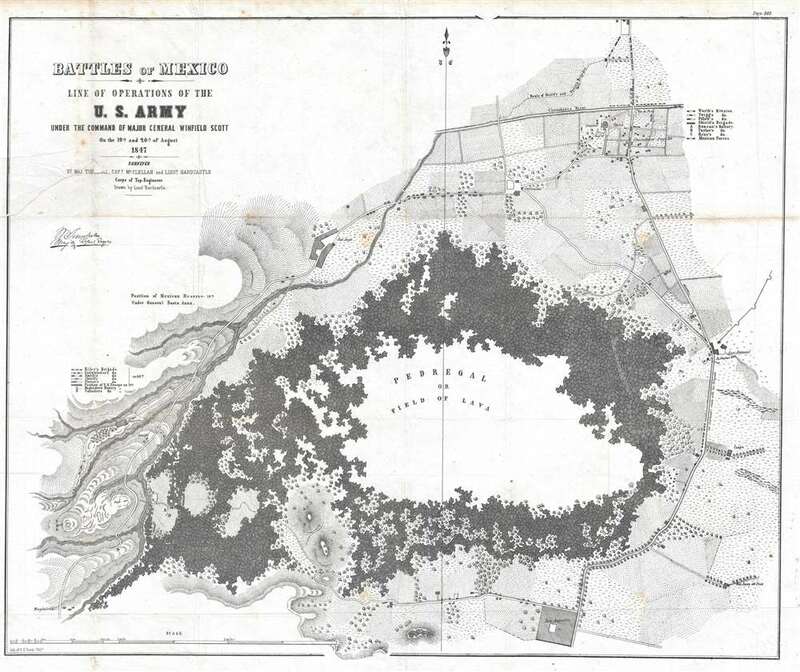 This is an 1847 Edmund Hardcastle map of the Battle of Churubusco during the Mexican-American War. The map depicts a region southwest of Mexico City surrounding the lava fields of the Pedregal de San Àngel, today the fashionable upscale residential neighborhood of Jardines del Pedgregal. Several buildings and communities are illustrated around the Pedregal, including San Augustin, San Angel, San Antonio La Isla (San Antonio), and Churubusco. Individual buildings are depicted along many of the roads, though most are not labeled. The Battle of Churubusco was fought between American and Mexican forces on August 20, 1847. Several small engagements were fought, including at San Antonio, at the Franciscan Convent of San Mateo in Churubusco and at the tete-de-pont on the south side of the bridge crossing the Churubusco River. Mexican General Santa Anna's forces initially mounted a defense at San Antonio, but their position was quickly overrun, and these soldiers withdrew to the convent and the bridge crossing the Churubusco. The American army, led by General Winfield Scott, was divided into several different divisions and brigades, each of which was given a different objective. All of these units, both Mexican and American, are noted here as rectangles shaded with different patterns, each of which identifies a different division or brigade. American batteries are also identified by letters. The Battle of Churubusco was the final battle before the Battles of Mexico City, which captured the Mexican capital and ended the conflict. This map was drawn by Lieutenant Edmund La Fayette Hardcastle and published in a U.S. government report in 1847. Though fairly well represented in institutional collections, this map rarely appears on the private market. Good. Wear and toning along original fold lines. Light foxing. Some creasing. Area of infill in upper left quadrant. Blank on verso.